The following conversation occurred between two girls from Southern California. The word like has become increasingly popular in spoken English in recent years, and has quickly become one of the most used words in conversation. Its uses are many, and it can be used to: stall for time; report speech; soften what you say; approximate; complain; and reinforce. Like is an important word to study because of how often you will hear it used in conversation. Learning how to use it properly will go a long way towards making you sounds more like a native speaker. Before we go further, I need to put up a disclaimer around the usage of the word like. When used in moderation the word like can be a powerful linguistic tool; use it too much and you risk sounding like a teenage girl. People who over use the word like are perceived as less intelligent and articulate than people who avoid using it. My advice to you is to only incorporate usage of the word like in 1 or 2 of the following ways, but not all of them. When “I was like” is used it doesn’t necessarily mean that you said something; it can also be used to designate that you thought something. So in this case “I was like” takes the place of “I thought to myself.” This is also commonly used during story telling. Like can be used if you aren’t entirely sure about what you are saying and you want to convey your uncertainty. When used like this, like should be before a number, time or quantity. Like can also be used to lessen the force of what you are demanding or requesting of someone. 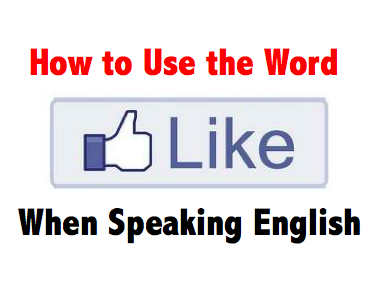 The last use of like is to add reinforcement to something that you are saying. I don’t recommend using like in this way, but I feel like I should add it in here for the sake of completeness. So like, that’s it. I hope you’ve learned a few new uses for the word like today. If you have any questions about their usage please leave a comment below. Have you ever heard someone use like in one of the ways described here? Leave your answer in the comments below. Tum ao to zindagi banjaigy mere. Thx for this lesson, Ive been really inspired by Jesse (Breaking Bad) saying ‘like’ in every single sentence and wanted to find out more about this ambiguous word ! Like wow. The word like can like be used in like so many ways in like English and stuff.